Lenin in Zurich - he was a founding member of DADA but in disguise.Most dadaists weren't aware of it. Lenin even wrote poems for Tzara.facts: Hugo Ball describes the first evening of DADA, Cabaret Voltaire, February 5, 1916 in Zürich:"... towards 6 pm ... an orientaly looking group of four small men carrying folders and images with them entered; ... 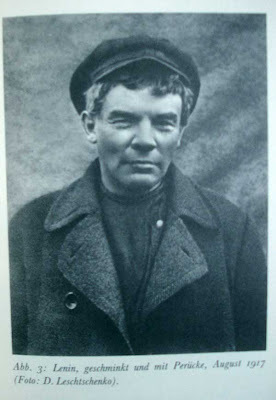 They introduced themselves: Marcel Janco, thepainter, Tristan Tzara, George Janco and a fourth man, whose name I can't remember " (meaning = this was Lenin in disguise)Most dadaists didn simply recognize Lenin (before he became famous) but didn't make the connection afterwards. Tzara did. Lenin's was a small but funny and oriental looking man (and there simply weren't too many during WWI in Switzerland) and this describtion of this "fourth man" is exact. Lenin was forced to hide in many occasiions since he already had some notorioty in the world. Lenin's apartment in Zurich was above a butchery and therefore they "couldn't open the window until late" (Krupskaya, Lenin's wife) which also indicated that he might have hang out in the next door Cabaret Voltaire. Lenin and his wife moved from Bern to Zurich becaue of Zurich's more intense social life. This happened exactly around the time, Cabaret Votlaire opened. Rainer Ganahl was born in Austria and has been living in New York since 1990. His artistic work often deals with the forms and content of education and politics at the intersection of linguistic and class issues.